WE FINALLY GOT THE GREEN LIGHT FROM THE MOZAMBICAN AUTHORITIES TO GO AHEAD WITH THE CAPTURE AND RELOCATION AND THIS PROJECT WILL COMMENCE SOON. FOR FUTURE UPDATES ON #SAVETHE27 BE SURE TO FOLLOW US ON SOCIAL MEDIA. For those of you don’t know about our #SAVETHE27 Campaign, here is some background. In April 2018, a team from ERP, made up of ERP director Jan van Rensburg, and ERP international Coordinator, Taun Bewsher, visited an area in Southern Mozambique where we had been alerted to the fact that a large number of free roaming elephant were potentially at risk. After arriving in Mozambique, we headed off to a local airfield to meet up with a pilot who showed us the area and help us get an aerial siting of the elephants in question. After about an hour and a half in the air, and just as we were starting to give up hope of locating the elephants, the pilot made a banked turn to the left, and as Jan looked out of his side window, he spotted the herd. We circled overhead to get a count, and we verified that there were at least 27 animals in the herd. It was an incredible sight. Unfortunately, our excitement was short lived, because as we flew a little further South, we encountered the potential threats to the well being of the herd. A large area, dotted with settlements, subsistence farms, and a handful of more commercial cattle ranches and pineapple plantations. A little further to the south west, a string of commercial sugar cane farms, a large village. This string of human settlements formed a barrier, hindering the free movement of the elephants, and also presented an enticing food source for the elephants, which would lure them in. If these elephants remain in the area, where they are not protected under any proclaimed protected area, and faced with so many opportunities to interface with human settlement, it is inevitable that from time to time there will be human wildlife conflict, as has already been reported to the ANAC (The Mozambican Wildlife Authorities). The authorities, limited by a lack of funding and skills to carry out a relocation effort, will be forced to euthanize or cull this herd, if the complaints from the villages and farmers keep streaming in. This kind of operation is exactly why ERP was established, so we didn’t hesitate taking on this relocation. It immediately became clear however that to get all the required permits and permissions in place, to allow us to bring helicopters and other equipment into Mozambique, as well as complying with all the veterinary control processes, was going to take time and that we would not be able to launch the relocation in 2018. We have therefore entered into an agreement with the Mozambican authorities, that they will stave off any lethal intervention from their side, until the end of April of 2019, to allow us to get everything in place to carry out the relocation of these animals. This gives us enough time to ensure that we have all the necessary permits in place, can legally get the equipment and veterinary drugs imported into Mozambique, and plan for all eventualities on the ground to ensure a successful operation. We only have one chance to get this right, so it is imperative that we plan every detail carefully. ERP plans to action this relocation somewhere between the 24th of March and the 10th of April 2019. The total cost of the operation is estimated at around $120 000.00(US). 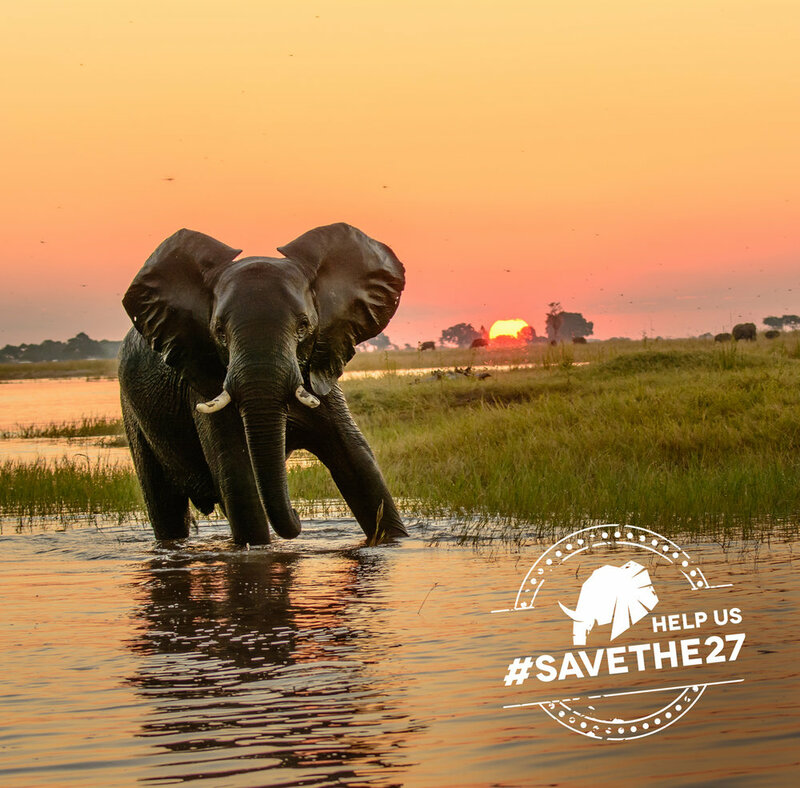 You can support the #SAVETHE27 Campaign by making a donation to ERP.